PERHAPS there are not many, even in Japan, who have heard of the 'Yuki Onna' (Snow Ghost). It is little spoken of except in the higher mountains, which are continually snowclad in the winter. Those who have read Lafcadio Hearn's books will remember a story of the Yuki Onna, made much of on account of its beautiful telling, but in reality not better than the following. Up in the northern province of Echigo, opposite Sado Island on the Japan Sea, snow falls heavily. Sometimes there is as much as twenty feet of it on the ground, and many are the people who have been buried in the snows and never found until the spring. Not many years ago three companies of soldiers, with the exception of three or four men, were destroyed in Aowomori; and it was many weeks before they were dug out, dead of course. 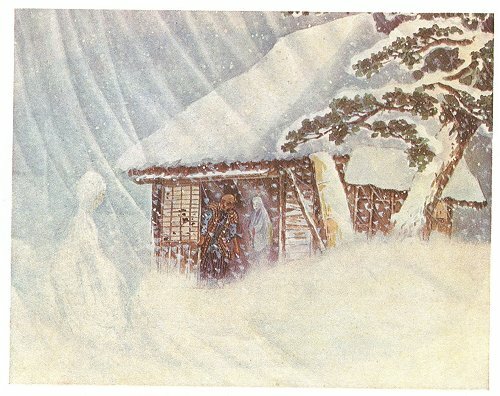 Mysterious disappearances naturally give rise to fancies in a fanciful people, and from time immemorial the Snow Ghost has been one with the people of the North; while those of the South say that those of the North take so much saké that they see snow-covered trees as women. [paragraph continues] Be that as it may, I must explain what a farmer called Kyuzaemon saw. In the village of Hoi, which consisted only of eleven houses, very poor ones at that, lived Kyuzaemon. He was poor, and doubly unfortunate in having lost both his son and his wife. He led a lonely life. 'Open the door! Open the door!' came the voice from outside. 'I don't want quilts or bedding,—only shelter,' pleaded the voice. 'I should not so much mind letting you rest if you were an ordinary woman. 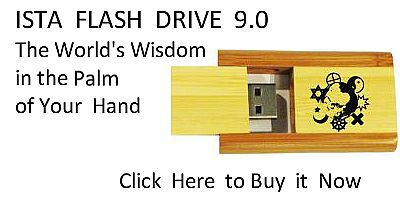 I should, in fact, be glad; but I fear spirits greatly, as my forefathers have done,' said Kyuzaemon. 'Be not afraid. You have a butsudan?' 2 said the figure. [paragraph continues] Yuki Onna (Snow Spirit) advance; but there was no sound of footsteps as she glided to the altar. Kyuzaemon retired to bed, where he promptly fell asleep; but shortly afterwards he was disturbed by the voice of the woman bidding him farewell. Before he had time to sit up she disappeared, leaving no sign; the fire still burned in the butsudan. Kyuzaemon got up at daybreak, and went to the next village to see Isaburo, whom he found living with his father-in-law, Yazaemon. On comparing notes Kyuzaemon and Isaburo found that directly the spirit of Oyasu had left the house of Kyuzaemon she appeared to Isaburo, at about half-an-hour after midnight, and stayed with him until he had promised to return to her father's house and help him to live in his old age. That is roughly my story of the Yuki Onna. All those who die by the snow and cold become spirits of snow, appearing when there is snow; just as the spirits of those who are drowned in the sea only appear in stormy seas. Even to the present day, in the north, priests say prayers to appease the spirits of those who have died by snow, and to prevent them from haunting people who are connected with them. 309:2 Family altar, in which the figures of various gods are set, and also the family mortuary tablets.